This means that on wet road surfaces, the risk of hydroplaning increases, in particular where speed is not adapted to suit the driving conditions. There is a risk of accident. If the tire pressure is too high or too low, tires may exhibit different levels of wear at different locations on the tire tread. Thus, you should regularly check the tread depth and the condition of the tread across the entire width of all tires. For safety reasons, replace the tires before the legally prescribed limit for the minimum tire tread depth is reached. 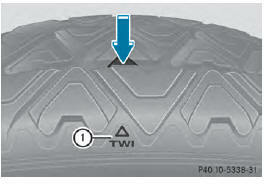 Bar indicator 1 for tread wear is integrated into the tire tread. this is the case, the tire is so worn that it must be replaced.